"I purchased a gorgeous boy from a breeding of Lady Piper and Buck, that produced my puppy born December 26, 2017. I want to share with you how he is doing t six months of age. Teddy was just 7 weeks old when we brought him home on February 10th 2018. From the get go, his temperament was wonderful! So loving, smart, and easy to housebreak. At six months old he is a beautiful,loving,dog! I'm 62 years old, for the last ten years we have had Boxers, my daughter has a 18 month old Boxer and these two boys are best buds! My point here is the difference between the two breeds is like night and day! Where the Boxer is super high energy and runs circles around Teddy, Teddy runs and plays awhile, (never catching up)and then just lays down. At my age, and while still quite active, (I live on 10 acres) I wanted a calm mellow dog to be my devoted companion. I got that in Teddy. He is everything I hoped he would be and more! He exceeded my expectations! Easy to train, super smart,calm, loyal, loving, soooo funny, and a good watch dog!!! He is NOT destructive, not a digger, not a barker and not a chewer. He HAS to have something in his mouth just holding it, bringing it as a gift. Mostly blankets and socks. But he's a retriever, that's what they are bred to do, and he is the best dog I have ever had or been around, and I was a dog groomer for years. That breeding produced an amazing dog! Your Buck sired wonderful puppies, and Lady Piper brought her wonderful attributes to the puppies. Teddy was neutered two weeks ago and never bothered his incision, he healed up beautifully. "I wanted to thank you for both Arthur and Enzo. We are so happy with both of them. They are wonderful in every way imaginable, and then some. The tip you gave us about keeping them separated by baby gates at first was perfect. We put Enzo in the family room and Arthur had the run of the rest of the house. The first day Arthur was not happy with me. He wouldn't let me pet him for 2 days. I stayed in the family room with Enzo for about six months keeping their play sessions short and positive. Finally, I felt that they could be together (and I wanted to sleep in my bed again) they became inseparable. I need to share a story with you though. We have an area where they go to the bathroom and it's big enough for them to run and play. One evening as the sun was setting, they'd been playing and it sounded like they were fighting. I never heard the kind of yelps coming from Enzo before. I ran to break it up and realized that Arthur's lower jaw had gotten Enzo's collar wrapped around it and it was twisted. Each time they struggled, it would tighten acting like a tourniquet around Enzo's neck. It took all my strength just to hold them still. Just then, my son, Matthew came out. I asked him to hold Arthur's jaws still so I could unclasp Enzo's collar. It worked, but Enzo wasn't breathing. He didn't breathe for close to ten minutes. I blew into his nose and he came around. I was afraid he had a broken neck because he didn't move. He laid there for a half hour motionless with his head in my hands. When I pinched his paw, he didn't react. We were going to carry him to the car and my other son came out to help. When Enzo saw Ian he just stood up and wagged his tail. During the whole ordeal, I tried to get Arthur to go away and he refused to leave Enzo's side.He was worried too. We took Enzo to the Dove Emergency Clinic and he had petechial hemorrhaging in his eyes. He didn't suffer any other injuries or complications. He is totally healthy and fine now. The vet said puppies are able to go longer than you would think without oxygen going to their brain. Our dogs never wear collars now. 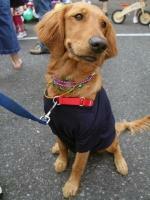 I try to tell everyone I can about what can happen with collars. We got lucky with our dogs, but it scares me to think what could have happened. We love both of them so much, and they love each other. We feel so lucky to be with such amazing dogs. Thank you so very much. "Here a couple pictures of Flash and Arrow! (Pups we got from your early September litter Millie/Cooper.) Lovely dogs! I tell everyone about you. I don't know how you ever let the puppies go! Loved Rusty long ago when we originally had a put of his - but Cooper is doing great for you!. Flash is most like Cooper - tons of energy, GREAT swimmer/diver, happy! 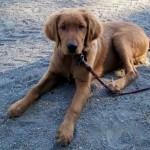 We have a little of Rusty showing through on Arrow - VERY trainable, smiles, would have been a fabulous therapy dog! 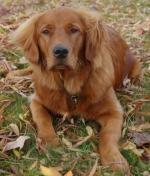 "We bought our beautiful Golden Theo from you (out of Molly and Chase back in 2006 (I believe). Wow, I was such a nervous nelly. We had lost two Goldens at Age 10 prior so I think I may have sent you over the edge with my worry and health questions. You assured me all was great with Theo's lineage and sure enough, you are right! He is 101/2 and going strong. :) we just love him to a million pieces. "I just wanted to touch base with you about Sophie and send you a couple of photo's. Sophie is just now 15 weeks, loves to play in the water, bark at cows and chase anything! She is very affectionate and loves everyone. She is crate trained to sleep at night, knows the commands come, sit, down, and off...working on stay. Lucy will be 11 years old in January, and she is very friendly and tolerant of all of Sophie's puppy antics (including chewing on her ear any chance she gets). "We were out having some fun with our wonderful Augie doggie this afternoon, and I thought you might like to see a picture or two of him. He is a little over three years old now (out of Daisy and Jake) and he just keeps getting better! "We picked up our Charlie on February 21 and it has been an adventure ever since!!! She is such a little brat. Stubborn, hard to housebreak, likes to bite to play and we love every quirk she has. She is the cutest, sweetest little golden ever. She is still getting used to traveling in the car. Isn't thrilled but she always settles down. She loves us and we love her. She is perfect for us. We just got her last shots yesterday and she weighs 26 pounds. Healthy and happy. She loves everyone (sometimes a problem!). Everywhere we take her she attracts people, especially kids and older folks. People are just attracted to such a darling puppy. She loves to be outside and we do have a small backyard where she spends a few hours a day. But we take her to our large front yard for play time. And we go on walks. She loves her toys in the house. No problem with her at night. She has a large wire crate and she has never fussed when she is in there at night. She loves to fetch. Doesn't quite get why she has to give the ball back every time but she does bring in right back. She is funny and sweet. The best puppy in the world. We love her so much. We are planning a couple of days at the coast and can hardly wait to see what she thinks of the ocean. "[Picture #3] is an after bath picture. Just under 5 months old,he is doing super. He can sit and stay,spin ,shake, working on heeling, and down. He is very smart. Earl is great. Thanks." Here's a cute video of Blaze, and his kitty Chaka. "I thought I would share a picture of Picasso at the Clark county fair. This [first] picture is Extreme Vertical (high jump), he jumped 5'6". In big air, long jump, he jumped 19'5". He is an amazing little boy." - Kim ... The second photo is Kim's goldens hunting for truffles." 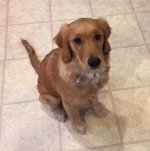 "I wanted to send you this e-mail and share with you how much we have cherished the little 12 pound golden retriever that we adopted from you at the end of August 2012. She was from Jake and Katie's litter and we named her Sophia. She is now 67 lbs of love and joy and turned 1 year old on June 12th. She has been through all the training classes at PetSmart and loved every second of being with the other dogs and trainers. We make sure to get in two walks a day that include chasing a ball in a field close to the house. She also has two cousins, a golden lab and australian shepherd, who make a wonderful pack that play on my sisters farm with 5 acres and a pond, where Sophi loves to swim, most weekends. When we adopted Sophi there was a young adult female there that had a green color and my husband fell in love with her because she was always next to or leaning on him during our visit. Sophi is starting to develop the habit of being close, leaning or touching one of us when we are doing our daily activities in the house. She is such a joy to have around we can't imagine what our life was like before her. I see that you have two litters currently. We have been giving some thought to getting Sophi a companion. 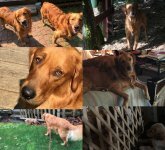 I would like to rescue a dog but Sophi is just the best dog that I am also thinking that having another of your wonderful Golden's would be the perfect match. Do you have any girls available? As a breeder, do you suggest that we wait until Sophi is 2 yrs old before bringing another dog into her home or is there a better time for this transition? Do you ever adopt out any of your older dogs? I have included a couple of pictures of Sophi! Just wanted to let you know how things were going with Blaze. We brought him home on Dec 16th 2011, he was 7 wks old, and it was probably one of the most exciting days of my life. My husband and I couldn't have children so getting a dog was the next best thing . For myself, this is the first dog I've ever had as an adult so I was pretty nervous being a first time dog owner. Puppies, so I've learned, are quite a handful for the first couple of months, but once that adjustment stage passes it's the most wonderful experience ever. Blaze is now 18 wks old, and I'm sure all people say this about their puppies but, he's the smartest puppy ever. His commands consist of sit, shake, other paw, down, stay, leave it, drop it, come, out, speak, and high 5. I'm probably forgetting some, but that gives you a good idea. He is in his 4th wk of beginner puppy school, and he loves it! I've spoken to the trainer in regards to Blaze being a therapy dog, and she says that he would make a great candidate for that because of his super calm demeanor, which he gets from his Mommy Cassie I think, and btw his Daddy is Jake. That's a big factor in why we chose her litter. Everywhere we go people compliment him on his calm, well mannered personality, which makes me very proud. Everyone also thinks that he is the most beautiful Golden that they have ever seen. I'm hoping to have a walking and hiking partner soon. Blaze is still learning to walk nicely on a leash. He is doing quite well, but still has some issues with eating everything in sight, lol, but it won't be too much longer since he knows leave it, and drop (unless of course it looks really tasty). I just wanted to thank you, and commend you for breeding such beautiful pups, and we are so thankful that we found you. Blaze has brought so much joy to our lives, it's hard to put into words how much he means to us. We have 5 cats, and they all get along really well. He still chases them a little, but is starting to slow it down a bit, and they seem to really like him. 2 of our cats sleep in his crate during the day when he's not in it, it's very cute. Thank you so much again for our beautiful baby Blaze! "We purchased our little girl from you on 3-19-11. [W]e wanted to send you a few photo's of how adorable and beautiful she is. And how much she looks like her mom....Sadee May. Her Dad is Cody. She was named "Tessie". (thought we were going to name her Lucy) But our son loves the Boston Red Sox baseball team, and that is their team anthem song, so it is original and meaningful to him and his dog, so he wanted to name her. She is the BEST dog and we are so incredibly in love with her. At 5.5 months old she already can: On command: Sit, Lay Down, Stay, wait to told it's OK to eat....she sits at attention. She still fetches, catches anything, newest trick....she can catch a treat off of her nose and holds it till we tell her OK... She shakes with both paws, sits at door to have feet wiped off before coming into the house. She is such a cuddler, loves car rides, going for walks. We are taking her to the beach this week and can't wait to watch her in the water! She is such a smart girl and very easy to train. We were all potty trained in less then a week!!! Her only faults: she chews/eats rocks, howls at neighbor dog, vaccum, lawn mower, but doesn't run away from it, loves to steal socks, dish towels, small pieces of clothing, doesn't like her nails clipped. "[We] wanted to send you a quick update on Remy. 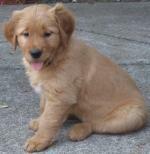 Remy was the last puppy out of Sadee and Cody's January 2011 litter. So far Remy has been a great pup, He has fit right in with the family and Khloe (our other golden) loves him very much. 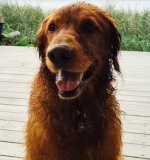 He is very attentive and loves to take walks in the country off leash with us.Remy is a true retriever and loves to get everything and bring it to us. Remy has now completed 3 of 4 doggy training classes and once the classes are complete we will continue to work with them and Khloe and Remy will be CGC certified so that Heather can take them to work (school) with her as reading dogs. This past weekend we took both of them up to Rimrock lake for a weekend of camping and it went extremely well. Remy has begun to learn how to swim (he took to it naturally) and is going to be a great swimmer. Both dogs will be making a cross country trip with us later in July and will be heading to our cabin in Canada for a week of R&R and more swimming! "I just wanted to give you an update on the puppy we got from you on March 18th (Cody & Lexie's puppy, Oct. 30). We absolutely love her! She has fit in to our household so wonderfully, and she gets along great with our chihuahua and cats. You would love to see how Bella and Babbit (the chihuahua) chase each other around the house and play, it is very comical! Bella is currently asleep on the couch next to me--she thinks if that is where we sit then she belongs there too! She is such a gentle soul and is wonderful with small children. We had two parties last week, both with over 30 people, and she did great with the crowd of strangers too. Everyone is amazed at how quiet she is. "Love this puppy!!! She has been so much fun. She is by far the smartest dog I've ever owned. She is only 10 weeks now (tomorrow) and has really fit into our family. In the mornings, I let her out to go out and do her thing. I've always wanted a dog to bring in my newspaper when it's raining. After 2 days of showing it to her on our driveway, she retrieves it and brings me my paper. I substitute out the Sunday paper for her (too big for now). The first week I taught her to sit and not to jump up on the kids. She pretty much now can sit on command. Coming to us on command is still getting trained. She loves to explore everything outside. I walk her around outside on the sidewalks in our neighborhood, but on rainy days she gets awfully wet. Tonight, I tried introducing her to our treadmill. She walked on it after working with her for just a few minutes. Now I have a good way to exercise when the weather is fowl. She is an awesome retriever. She brings balls and her multitude of toys to us for a quick toss across the house. I can't tell you how happy we have been with her and her awesome personality. We really love our dog. We'll keep you informed of more adventures. Our veterinarian really likes her as well. She gets another shot tomorrow. Checked for worms and all was clear. Our vet thought she was just perfect and in great shape. 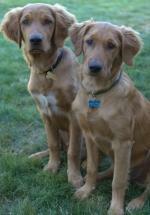 "[Here is] a recent picture of the puppies we got from you, Oliver and Sophie [parents are Lexie and Chase]. They are doing great! We love them tons and they are doing well with their training. "In 6 more days Charlie will be 1 year old. I can't believe it. I got him right after Thanksgiving 2009 when he was 4 months old. His parents are Reggie and Bailey. 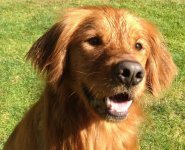 I already had another Golden who was just 17 months old at the time but had wanted one of your dogs for about 3 years. He is such a joy. He is so smart. After taking him to the dog park the first day on a leash I could take him off-lead and he just came when called, better than my other dog, Annie. Also, he was never in a house but seemed to know to go outside 'to do his business' so I didn't have to house break him. On the drive home to Portland he got car sick and still doesn't like to ride in the car. He lies down and puts his head behind Annie when we have to go anywhere. All the usual commands (sit, down, wait, stand, etc.) he learned on the first or second time (he was copying Annie) and he retrieves like a natural and automatically drops the ball. No training needed there. He loves the water and dives in the kiddie pool when it is hot. Annie hates the water, unusual for a retriever. He is very affectionate, always by my side, even in the bathroom. He has his head on my foot when I am standing at the sink or when I am sitting at the computer. He did bite through the key board cable once but that's about it for naughty behavior. He is friendly to everyone, dogs and people alike. Unfortunately he was attacked by a neighbor dog when he was only 5 months old and needed 9 stitches in his face. It has healed nicely and he has a faint scar. It didn't affect him in any way in his attitude toward other dogs. "We bought a girl pup from you last fall, pup #50, from Bailey's litter. We brought her home in early October and she has been such a joy. She is now about 55 lbs and all feathery. we named her Gobi - based on her desert color and also it is one of our favorite overseas trips to the Gobi Desert. She is just great and while still a puppy has learned quickly and become a special member of the family. "Chief turned 1 year old on Dec. 18th & he's recently learned (without our teaching, mind you) how to open doors. Our doors have the latch handles instead of door knobs and he's tall enough now that they are just 'mouth-level'. I work out of my home and today, one of my friends stopped by today to return a card table & chairs she'd borrowed. She was in a hurry because she had to pick up her son & take him to the doctor because they thought he'd broken his toe. So, she brought two of the chairs into the house, greeted Chief and I told her I'd help her with the remaining items. I grabbed my phone in case I received a business call while I was outside. We left Chief inside and when we returned to the front door, we discovered we'd been locked out! In his attempt to open the front door, his nose must've hit the deadbolt lock and locked the door. All of our garage doors were closed. I climbed over the fence to check the side garage door to the backyard and discovered it was locked. I then walked around to the back door; it, too, was locked and all of our windows were closed. My husband was running errands in Lake Oswego and I was able to reach him on the cell phone and he came home to let me in. Fortunately, I only had to wait outside for 30 minutes and it only sprinkled slightly, so I didn't 'freeze' or get soaked. This was Chief's first time being left unattended in our home and I was concerned about the possibility of his pulling paperwork off my desk and shredding it or getting into something he shouldn't, but he was very good and just waited until Phil got home to let me in. Of course, I learned a lesson today about the importance of needing a key when I leave Chief alone! Yesterday, while walking Chief in our neighborhood, one of our neighbors told me Chief is the most beautiful dog she's ever seen!......AND�. she has 2 small dogs of her own! "Thank you so much for bringing Murphy into our lives. Since we picked him up on Tuesday evening, he has had no transition issues whatsoever. He has been the easiest to train. He already knows how to sit, his name, his toys, and how to use the facilities. He loves up everyone he meets. His crate training has been a snap. He loves going to work with me & just follows me so naturally. He woke up once the first night & settled down within 15 minutes & has slept through the night ever since. He is also a real munch mouth- no issues with eating his kibble or drinking. He loves his car rides & is wonderful with kids. I can not say thank you enough. We appreciate the time you provided us to "test" the puppies. It was not easy leaving with one; eventually, we will add another. 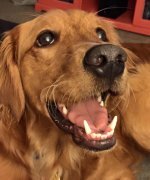 There is nothing like the love and energy of a Golden. My 81 year mother simply melted into the heart of an eight year old when she met Murphy and he loved her instantly. "I just thought I would send you some pictures of my little man Charlie, he is from Cassie and Chase's Aug 1st litter. He is quite a little heart-breaker wherever we go. He is a happy little guy. But I have to tell you the funniest thing, you warned me about his dad liking rocks, and I laughed...but it looks like it is a trait that got passed down!! I have a pile of rocks on the inside of my front door from when Charlie and I go out for walks! He likes to carry them in his mouth. I am just so incredibly happy that Charlie is a part of my family and he has won the hearts of my family and friends as well. Thanks for my little man. "What a fine dog Chief is becoming. He turned 11 months old a week ago today and weighs just over 80 lbs. I've attached a few recent pics for you to see. I cannot tell you how many compliments he's gotten � he even has a 'Fan Club' at OHSU's National Primate Research Center, the Children's Clinic near St. Vincent's Hospital and West Coast Bank. He loves everyone and they all tell us what a handsome, magnificent, beautiful, cute, gorgeous animal he is. Of course, we agree! Just last night while shopping at Wilco Farm Store, I gave 2 people your name & website. This Thanksgiving, we are grateful for so many things and especially for the new addition to our family. "We thought we would drop you a quick note to let you know that Pup #2 (tentatively named "Jasmine") is doing well. She has had no problems with the transition. Her appetite is good, she is sleeping well and is mostly pottying outside. We took her to our vet on Friday and he said she is in great health. She weighed 9.7 pounds. She slept on the examining table! We took her up to our cabin this weekend (she rides just fine in our car or our truck). She loves being out in the woods! Every pinecone and stick needed to be investigated. I'm attaching two pictures we took this weekend. 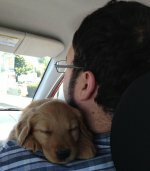 "It's been 7 months since we picked up our little guy and I thought I might share a few pictures with you! Brody, has grown up to be quite the looker :-)� He's one of Sammy's puppies from Her and Reggie's litter born January 15th.� He has been deemed the cutest puppy ever by the drive-thru barista at Starbucks. 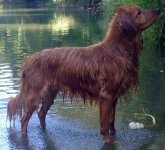 He has become such a handsome young man, and the temperament of a loving little boy.� He's daddy's pride and joy, becoming a great fishing partner, and attached�at the hip to me.� He has successfully completed "puppy school" (a.k.a. Dog obedience) as one of there youngest members @ 5mths. "Just had to share this picture I had taken of Maggie (14 wks. old) this past Saturday. It was a fund raiser. I had a hard time finding something that would not look too silly on her, most everything was for Halloween." 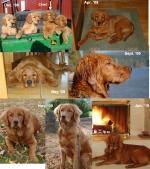 "We just wanted to let you know what a wonderful dog Mac has grown into. His parents Hannah and Chase would be very proud of him. At 9 months he's 70 lbs of total sweetness! He always comes home from his playgroup with a report card of 'straight As' and has been labeled the 'teacher's pet'. He has a sweet, laid-back personality and is wonderful with our boys and cats. You may recall, we came to you after we suddenly lost our beloved Senior Rescue dog, Pip. Our family was devastated and wasn't sure if another dog could fill our hearts. Mac has become such a wonderful part of our family and we're proud to have such a beautiful, well behaved and friendly pet. "Mandy just lost her last baby tooth today and is growing like a weed. She is about 18 inches at the shoulders and weighs about 40 lbs now, with a beautiful waist line. She is scheduled for her de-flowering on Feb. 1. Nothing is safe around her, she has to check everything out and be right in the middle of what ever we are doing. She has a mandarin orange box that we have attached a string to that she just loves to grab hold of and race around the room with that box flying along behind her. We think it is her favorite toy. She loves to go for rides in the van and take walks. "Josie is doing great. She's getting along really well with my other golden, and they have a lot of fun playing together. I have to wonder, though, if you bred these puppies to have super bladders -- she has never had an accident in the house, and started going to the door to be let out the second day. She sleeps on the bed and just sleeps there all night. What a great little girl. "Wow! 11 weeks old and [Nugget] has gained 4 lbs since he came home... not even two weeks yet. The little Nugget guy is really delightful. He has (so far) been the perfect gentlemen when it comes to Auntie Shiley. No chewing on the ears or tail and he only jumps when she's getting attention from me - we're working on that. He's crate training while I'm at work and has had one accident on the carpet (thankfully, it was nice and solid) when I wasn't paying attention late in the evening. He's quick to understand 'no' and 'down' and 'stay" and 'potty'... and he comes to his name. Not bad for 10 days, I think. He's anxious to please and sees me as the alpha female. Sure hope we keep him on that track. I'm actually surprised at how quickly he moves from his 'too happy your home' phase to 'pleased to be just hanging out'. He settles pretty easily and is a mellow little guy. I'm afraid the honeymoon is going to end - surely it must! Shiley is remaining Shiley... patient and tolerant and passive and willing - just as good natured as ever. I sure hope she passes that along! Oh, my gosh... will I miss her when she goes - I think of that too often I think. Guess I'm a little scared. Nugget and 'Toffee' our Calico are getting acquainted slow and steady. He's interested in her and will occasionally bound her way, but she's learned to not be afraid, so she doesn't run. I think it won't be long before they will be playmates - and they both have the energy for it. 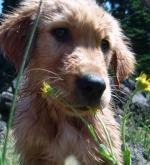 "Hi Cindy, I have been meaning to write and let you know how much we are enjoying our new puppy. Life is busy and fun so a whole month has gone by so fast. "Koda" [Lady Madaline and Sir Maxwell's puppy] is a wonderful addition to our family. He is growing so fast and is so smart. He is already potty trained and has learned most of the basic commands very well. Our 2 year old lab mix (Lucky) was initially a little jealous but they have grown to be pretty good friends. Koda wants to do everything Lucky does (right or wrong) and it is so cute to watch them together. After buying numerous chew toys in preparation for Koda's arrival, his favorite toy still seems to be Lucky's bushy tail! Thankfully Lucky is pretty easy going and tolerant of all this. "Richard and I wanted to send you a quick update on our baby boy we bought from you last summer. First we would like to thank you for the quality of dogs you breed. 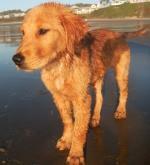 Before buying Tucker we did lots of research on the breed as well as visited many litters. Well, there was just no comparison. You guys breed beautiful dogs with excellent temperaments. We are having so much fun with Tucker. He is ten months old now and weighs 90 pounds! One of his favorite things to do is bring you little treasures. Throughout the day he finds things (usually the kids toys) and brings them to us. He doesn't chew his treasures however, he just likes bringing us things. He also loves going on runs with me. We are up to four miles now but the fourth mile is quite a bit slower than the first. He hasn't quite learned how to pace himself. You hear all the time what great dogs goldens are but until you have one of your own you don't know what you are missing. They are amazing dogs. All they want to do is be around you and please you.